Home MTAANI NEWS Clergy appeal for calm as Supreme Court decides, rubbishes secession talk. Clergy appeal for calm as Supreme Court decides, rubbishes secession talk. Head of Foundation Gospel Ministry International in Kenya Assistant Cardinal Gilbert Wanderi Mwangi handing over the tools of trade to the newly ordained Bishop James Angwenyi in Thika on Sunday. A section of the clergy have urged all Kenyans, regardless of their political divide, to be ready to accept the decision of the Supreme Court once it delivers its ruling on the petition over the presidential election results. Led by the Head of Foundation Gospel Ministry International in Kenya Assistant Cardinal Gilbert Wanderi Mwangi, the religious leaders asked both the Jubilee Party and National Super Alliance (NASA) principals to lead the pack in allowing justice to prevail. “As the church, we plead with all Kenyans to let the judiciary do its work without any interference. 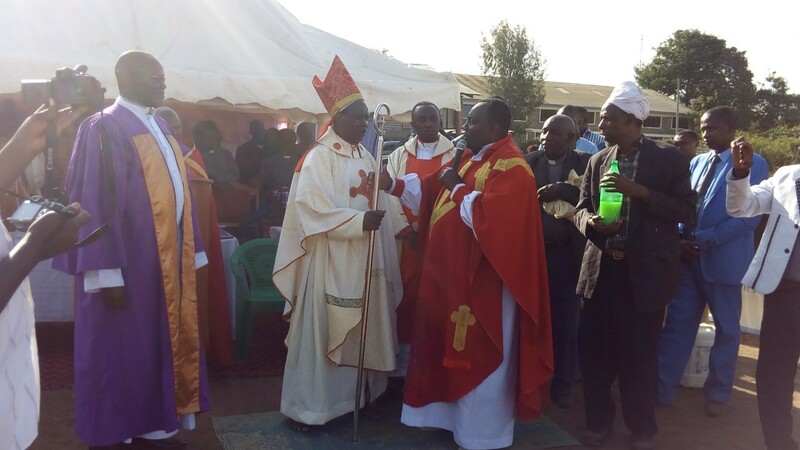 Whatever the outcome, we should all respect it and embrace the unity and sovereignty of our nationhood,” said Cardinal Wanderi in Thika during the ordination ceremony of Bishop Simon James Angwenyi on Sunday. The cardinal also pleaded with politicians to refrain from uttering words that could trigger unrest and disintegrate this country on ethnic lines. He added that the talk on secession was uncalled for as it would only serve as a catalyst to tribal animosity and probably plunge this country into political chaos as witnessed in 2007-8. Wanderi noted that the unity of our nation could not be compromised to suit the egos and whims of a few individuals or groups thus Kenya must remain united. “The talk about secession is ill-advised and will divide Kenyans along tribal lines not forgetting that this may most likely disintegrate into anarchy. Our unity is ‘our last best hope’ and not these dangerous thoughts of splitting the country into Jubilee and NASA Zones. Bishop Angwenyi called on the clergy to join hands and pray for peace as it was paramount. He also appealed for calm as the Supreme Court undertook its mandate to decide on the presidential petition. “Without peace we do not have a country. Without peace, we even administer our normal day to day chores. We need to pray for peace and love to prevail. We believe that whatever decision that will come out of the Supreme Court will be the will of God and everyone should respect it,” said Bishop Angwenyi. The narrative of secessionist gripped the nation early last week, after NASA leader Raila Odinga's technical adviser David Ndii lend credence to the secession talks after he shared the online petition on his social media page, a move that he defended while appearing at a local TV station. The petition that targets 15 million endorsements, has already been signed by over 10,000 people. At the press briefing last Friday, National Cohesion and Integration Commission (NCIC) chairman Francis Ole Kaparo maintained that there were better ways to resolve political differences, noting that going separate ways was never an option. “There are better and legal ways of solving our grievances than resorting to secession which is treasonable offence. We cannot dismember Kenya because of political differences of some leaders,” he said. Kaparo appealed to leaders to stop the separatism debate, which he termed as dangerous to the country. “It is absolutely reckless for a leader of sound mind to even contemplate splitting Kenya into two. Talking about secession itself has the capacity to destabilise the country's social fabric,” he cautioned.